Muhammad Ali: What made 'The Greatest' so great? It is crass, I know, to reduce Muhammad Ali's greatness to little more than a game of Top Trumps. And how great, really, is a man who happens to have been conferred with the tools to render another man senseless? But there's the thing. Even if you consider feats of athleticism to be trifling in the grand scheme of things, there is a chance you still find Ali compelling. Because, with Ali, athletic feats were only a part of the whole. Ali created the mould for the modern athlete and promptly broke it. No athlete has been so great in so many different ways since. Here, BBC Sport breaks Ali's greatness into its constituent parts, in an attempt to explain why there has never been anyone greater and probably never will be. Most boxing aficionados will tell you Ali wasn't even the greatest boxer of all time. But with the very next breath, they might tell you he is the greatest sportsman. This is because making comparisons in boxing is a less exact science than making comparisons in other sports. People will tell you Jack Nicklaus is greater than Tiger Woods because he won more majors. They will tell you Sachin Tendulkar is better than Brian Lara because he scored more runs at a higher average. But attempting to compare boxers who fought at different weights in different eras is the way to madness. Still, it is true that Ali didn't fight on the inside, would lean back rather than slip punches, didn't set his feet and was susceptible to left hooks. And old-timers who saw both in action said Sugar Ray Robinson, who lost only one of his first 131 professional fights, was a more complete fighter. "Robinson," said legendary American boxing writer Bert Sugar, "was the sweetest practitioner of 'The Sweet Science'." However, one of the marks of greatness is the ability to perform great feats without the use of a textbook: true greatness comes from within. And just as coaches tell kids the single-handed backhand is redundant, despite the fact Roger Federer has won 17 majors with it, they will also tell kids that to fight like Ali is nuts: "Gloves up, chin tucked in - and stop mucking about." But saying Ali wasn't as good as Robinson is like saying bliss isn't as good as nirvana. And a frightening thing about Ali is we might not have seen the best of him. Exiled from boxing between the ages of 25 and 28, Ali was spreading his anti-war message on the college circuit when he was at his most vital as an athlete. On paper, Ali is the greatest heavyweight in history. The first three-time world champion in boxing's blue riband division - when there was only one heavyweight world champion at any given time - Ali fought all-comers and whupped almost all of 'em. Another mark of greatness is the ability to evolve and in Ali's case there were four distinct ages: Olympic champion Ali, the innocent boy with a grin; pre-exile Ali, when his feet were a whir, his hands were a blur and nothing could touch him; post-exile Ali, a thicker, slower version with courage to burn; fading Ali, an empty shell of a man whom none of us wanted to see. Ali reigned in arguably the most talent-rich era of heavyweight boxing, winning the title from the fearsome Sonny Liston in 1964, winning it again from the even more fearsome George Foreman 10 years later and beating greats such as Floyd Patterson, Joe Frazier and Ken Norton in between. Even Ali Marque 4 had enough to win the title for a third time from a youthful Leon Spinks. Ali gave us the Rumble in the Jungle and the Thrilla in Manila and many iconic moments in sport. But if anyone wants proof that athletic achievement is about more than a win on the record, I suggest they rewind all the way to Ali Marque 2, particularly his fights against Cleveland Williams and Zora Folley. "Most fight fans would not spend a dime to watch Van Gogh paint Sunflowers," wrote Sports Illustrated's Pat Putnam, in reference to Sugar Ray Leonard's "artistic perfection". "But they would fill Yankee Stadium to see him cut off his ear." In his pre-exile pomp, Ali gave fight fans both artistry and gore. Boxing allows for greater feats of heroism than other sports. Kicking a ball around with opponents trying to kick you and thousands looking on might get the ticker going, but it's hardly on a par with being attacked by a 17st man with wrecking-ball hands. Like men born at the wrong time and forced into wars, in some respects Ali was an accidental hero. Liston was the most hated heavyweight champion in history and considered almost unbeatable. People genuinely thought Ali might be killed by Foreman. Ali claimed he almost did die in his third fight against Frazier. But accidental or not, heroism garners great respect. Even those that hated him for his political and religious views - and the fact he refused to be forced into a war he never asked for or agreed with - had to admit: "This black Muslim who talks too much - he sure has got gigantic cojones. I will give him that." Heroism and charisma go hand in hand: with less talent and without the great wins over fearsome men, Ali might have been just another loose-lipped, wise-cracking boxer with a couple of mentions in the history books. Indeed, Ali would have been like his younger brother, Rahman, a mediocre fighter with little of importance to say and famous only because of his connection to Ali. Which is not to say all sporting greats have charisma: entering a room full of people and inducing silence simply because you are famous is not the same. Take Sir Donald Bradman, without question the greatest cricketer ever, of whom it was once written: "One thing I have noticed is that he can sit still." Ironically, it was also written of Ali that he was able to sit still: when the cameras were off and the pens were sheathed, he could apparently be a peaceful presence. But other times he was throwing parties for local kids on his front lawn; reciting poetry; baiting opponents; pouring forth on politics and religion. It wasn't always nice and it didn't always make sense, but it was always irresistible. One of the reasons Ali was charismatic was because he was funny. Genuinely funny, not "presumably this must have been funny back in the day" funny. "I saw Sonny Liston a few days ago...," goes the interviewer. "Ain't he ugly?" deadpans Ali. "He's too ugly to be the world's champ, the world's champ should be pretty like me." He also did slapstick. Later in the build-up to their first fight, cameras caught Ali chasing Liston, "the big, ugly bear", down the street with a lasso. When The Beatles came to town, the story goes John Lennon didn't want to be photographed with Ali because he thought he would lose. By the end of the session Ali, who didn't even know who The Beatles were, had the four of them jumping through hoops. In one five-minute interview, Ali could make you laugh more than Tiger Woods, Roger Federer, Lionel Messi and Tom Brady have in their entire careers combined. Actually, make that a five-second interview. Women have always found hard, powerful men appealing. It's just that hard, powerful men aren't normally funny. And they don't normally look like Ali. Ali was wrong: he wasn't pretty, he was knockout beautiful. Here's how Ferdie Pacheco, Ali's personal doctor, described his patient: "He had huge shoulders and a broad back which tapered to an extraordinarily small waist. [His skin] was very smooth and soft, and was a gorgeous golden colour. "In the sunlight, covered with sweat, Ali was a photographer's dream." There is an old Chinese curse: "May you live in interesting times." It was both Ali's good luck and misfortune to have appeared at one of the most turbulent times in American history. Misfortune in that his rebellious nature made him deeply unpopular with millions, good luck because it magnified his rebelliousness, his courage, his greatness. People listened to what Ali had to say because of what he achieved in the ring. But it helps if you've got something to say. Whereas Ali was a rebel, Michael Jordan was a brand. Whereas Ali set out to influence his times, Jordan remained aloof. "He's more interested in his image for his shoe deals than he is in helping his own people," American football great Jim Brown said of Jordan in 1992, which was pretty much the height of his fame. 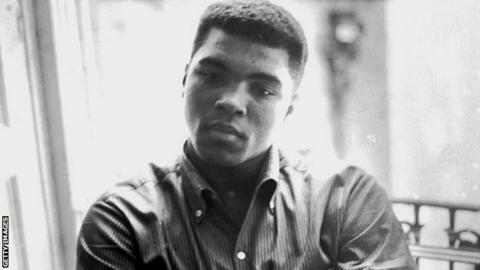 Ali declared he "had no quarrel with the Vietcong" in 1966, a year before the first significant anti-Vietnam War protests. The governor of Illinois called Ali's stance "disgusting" and boxing boards banned him. By 1971, only 28% of Americans agreed with their involvement in the conflict. Ali was a radical, which explains why he was so forceful and magnetic, because he was fuelled by his beliefs. What Tiger Woods believes about the world is anybody's guess. He likes golf? Maybe. Although you wouldn't really know it.